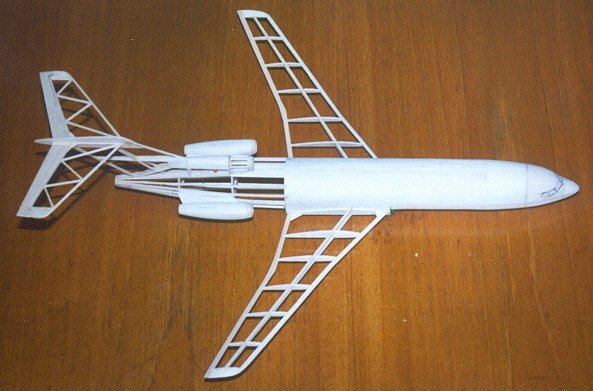 This is my second Rapier-powered airliner - a Boeing 727-100, 13" span for Rapier L2 power. The parallel bit of the fuselage is 1/32" sheet wrapped round the formers and four keels. The nose is part planked, part blocked. I drew the cockpit windows on with a biro to help me get the shape right. The model was covered with Japanese tissue, and airbrushed with enamel paint thinned with cellulose thinners. Some markings are home made decals, others are taken from a commercial decal sheet, with much cutting and pasting to get the cheat lines the right shape and size. Total weight came out at 34 grams, including the motor. There is a single trough for the motor, which is mounted in the wing centre section. The wing to fuselage fairings in front of and behind the wing are laminated from 1/32 and 1/16" balsa. Action shot taken by Richard Crossley of the model at Old Warden just after a successful launch. Here are the bones of my 11" span Douglas Skyray, which is powered by a Rapier L2. Lovely aircraft, but a tricky shape to model - you can see little inset bits of sheet and block in areas where I was afraid of getting tissue wrinkles later. I used an almost symmetrical wing section for appearance sake (Keil Kraft did the same on theirs). 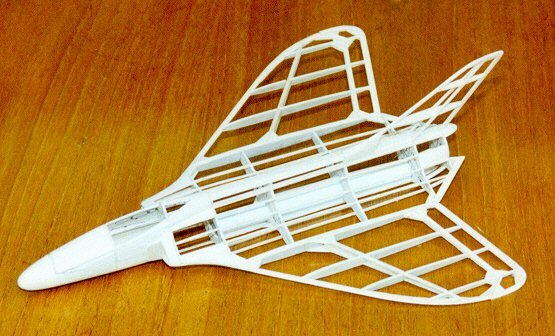 The outer wing panels have hinged elevons so they can be bent up for stability. There is also a little dihedral. Below is the finished model - note the angle of the elevons. All-up weight with a new Rapier L2 installed is 26 grams. The model is covered in Japanese tissue, and airbrushed with Humbrol enamel paint thinned with cellulose thinners. The decals are home made items. The picture below shows the motor installation and trough location. 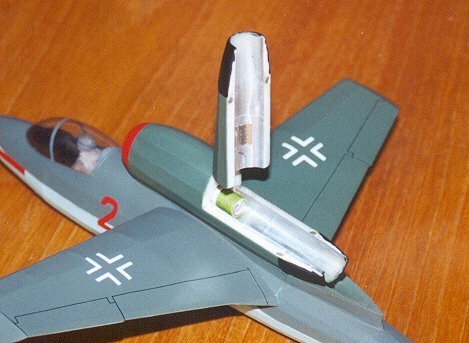 The model was trimmed using Rapier L1 motors pushed into the L2 sized tube, but using a removable spacer to get the back of the motor at the same place as the L2 would have been. I needed some noseweight to get a reasonable glide, then tried some powered flights. The plane looked stable enough, but just would not climb. It was trying, but the drag of the large wing was just too much - it was staggering around on the brink of a stall. Egged on by some spectators, I tried an L2 motor, and the result was a dramatic improvement, with a strong climb out and a nice high level cruise. Despite its small size, it did not look overpowered. Along with most other small scale jets I have seen, this is prone to trim changes during a flying session, even if nothing has been adjusted. 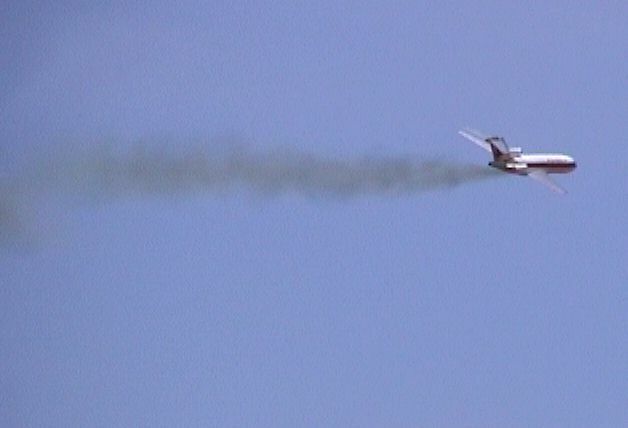 The Skyray occasionally gets itself stuck into a decending spiral flight pattern which it seems unable to get out of. I have seen other deltas do the same thing, so it may be a feature that afflicts this wing form. The plane is happily completely undamaged - it seems to bounce well, without any noticable weak spots, apart from the tips of the elevons which protrude under under the wingtips and tend to collect grass! Click here to download the plan for this model. This is my only design for Rapier L2 jet power so far which features a fully enclosed motor. Span is about 12", exactly 1/24 scale. You can see the motor tube and green motor in the picture below. The cover is held shut by two pairs of 3 mm dia neodymium magnets - they are visible as as dark spots on the photo. There is a duct lined with paper all the way from the front of the nacelle to guide air over the motor. Behind the motor, the exhaust tube is paper lined with self adhesive aluminium foil. To avoid hot gas leaking from the sides, the foil lining from one half overlaps the lining from the other half. A test run with an L2 motor (90 pence down the drain!) showed that nothing melted or caught fire. No hot gas could be felt coming out of the sides of the duct, and it seems that cool air drawn over the motor helps to insulate things. Black soot marks only began to appear about half way between the motor and the back of the duct. The model is covered with white Japanese tissue, and airbrushed with Xtracolor enamel paints, thinned with cellulose thinners. 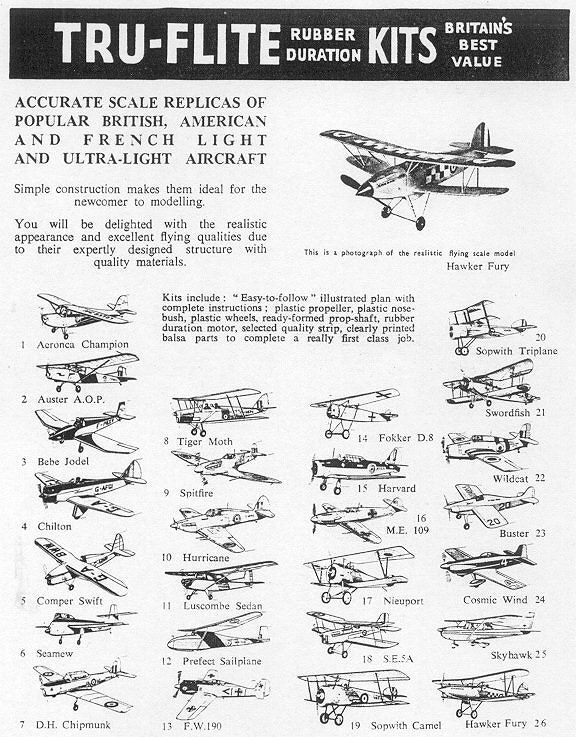 Accurate shades were used to reproduce a typical late war Luftwaffe scheme. Because the Xtracolor paints are designed for plastic models, they dry gloss (to enable decals to be applied without any visible "silvering" under the clear film) a coat of Humbrol aerosol matt varnish was sprayed on after everything was finished (masking the cockpit first, of course). All markings were hand painted, or home-made decals. Initial test flights were only moderately successful, though the internal motor mount worked fine. The model would climb out, then drop one wing or the other, before gently stalling and coming back to earth before the motor run had ended. I now wished I had put in a bit more dihedral! Further flights showed that the model was not really stable enough laterally, so I bit the bullet and cut the wing out of the fuselage. I split it at the centre and butchered it to give a bit more dihedral, then glued it back in the fuselage and did my best to patch up the joins. Another modification was to replace the rather vulnerable built-up tailplane with one from soft 1/16" sheet. 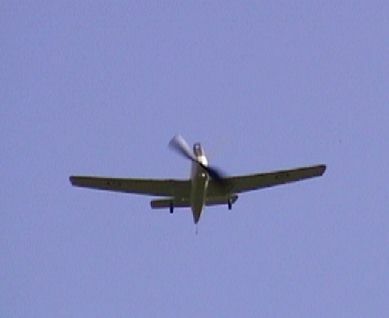 At long last I finally got a full flight out of it at the Old Warden Scale weekend in 2003. I found I needed to use a Rapier L2 rated at 140 mN to get it to go, which I suspect is due to the rather small air gap I have round the motor leading to drag, rather than thrust augmentation. The flight was a fairly exciting, steeply banked affair, but as the motor was exhausted before the plane hit the ground, that counts as a successful flight in my book! A few weeks later, I got a series of successful flights with the model, using a 130 mN rated L2 motor. This time the model spent more of its time going straight, and climbed much better than before (despite the lower power motor). Click here to go to the download page. The picture below may prove nostalgic for UK modellers of my generation - I remember spending a lot of time studying the catalogue when I was a kid, deciding which one to build next. All were designed by the late Phil Smith around 1950, and were relatively inexpensive. Accuracy was variable, and budgetary constraints meant the biggest wheels you ever got were 1" diameter, which looked silly on the WW1 types, and the props were pathetic little things which, if you used the thick rubber band provided, gave a power run of about 10 seconds (if you were lucky!) Moulded cockpit canopies were also a no-no - you had to use flat acetate sheet. 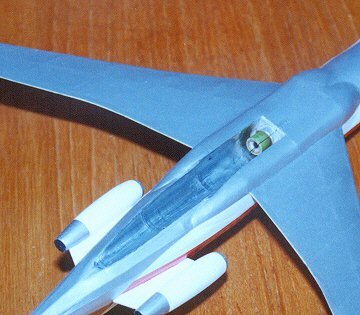 Having said all this, if you build any of these designs today, using light wood, a decent prop with proper removable nose block, and modern rubber, they can be made to fly well - a tribute to the soundness of the designs. The Tiger Moth, Sopwith Triplane, Luscombe Sedan and Comper Swift in particular are outstanding performers. 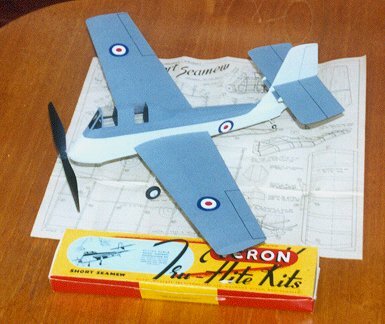 My Seamew was built from an original Veron kit specially for the 2001 SAM 35 Gala, where a scale competition was held for Tru-Flite models. I copied the printwood patterns onto new , much lighter, balsa, but used most of the kit strip wood. I added some sheet and block up front, to give someting more substantial to hold on to while winding, and added a removable nose block, but left all the kit outlines untouched. One modification I did make, however, was to decrease the tailplane incidence by raising the trailing edge 1/16" (I just cut the slot in the fin a bit higher) I felt the wing just did not have enough incidence relative to the tailplane as drawn to ensure good longitudinal stability. The model was covered in white Japanese tissue, and airbrushed with Humbrol enamels thinned with cellulose thinners. The model came out with a weight of 29 grams, with noseweight but without rubber. The prop is a Tern 6" plastic item, and power one loop of 3/16" rubber. No-one would admit that this plane is a beauty, or even that the kit is an accurate rendition, but it has a definite charm. I only had the chance to do a bit of trimming in the back garden before the SAM 35 gala, but at least I was able to get somewhere near the correct amount of noseweight on board. Initial flights at Old Warden looked promising - the model showed a distinct desire to turn right, so I let it. The little trim tab I cut out of the fin was useful for tweaking the flight pattern. When the time came to make competition flights, the wind sprang up, so fine-tuning the trim was almost impossible. The model climbed quite high on its best flights, but the longest time it managed was only 33 seconds. It coped pretty well with the wind though, and it will be interesting to see how it will go in calm conditions. 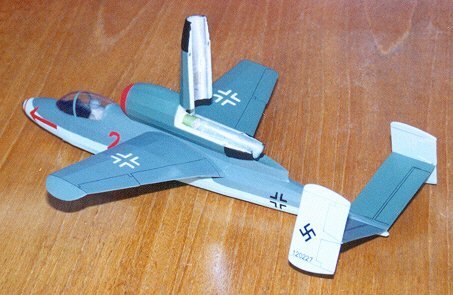 If I had got 33 seconds out of this model when I was a kid, of course, I'd have been thrilled to bits! 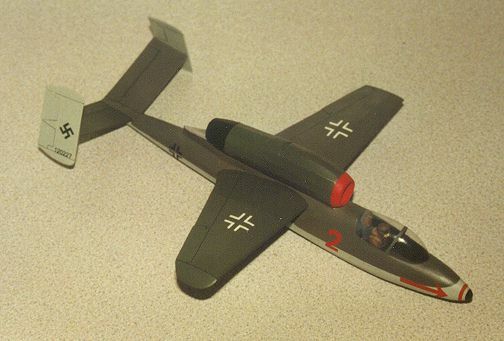 Since writing the above, the model has done a very pleasing 48 second flight at the Peterborough Flying Aces Meeting in 2002 - the photo above was taken there. 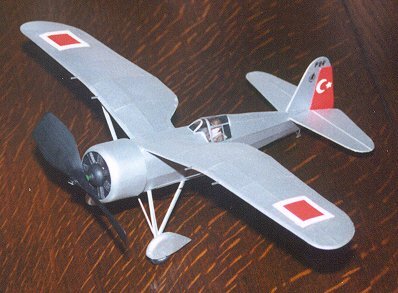 The PZL P.24 was the ultimate version of PZL's gull-winged fighter, and was designed for the export market - it was not used by the Poles themselves, but exported to Turkey, Greece and Bulgaria. I've always fancied building a model of one of the gull-winged PZL's, and when I found the peanut scale Pres Bruning plan for this one I knew I had to do it. 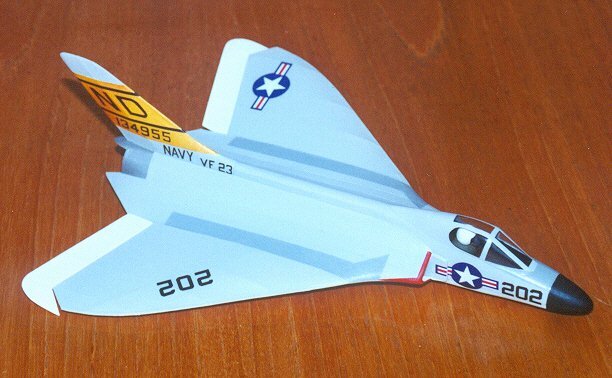 Structure is generally 1/20" square and 1/32" sheet balsa - the trickiest bit is the wings, for which you have to make a special balsa building board. The shape of the wing is quite subtle, not just two panels stuck together at an angle. Pres's interpretation of the wings looks just right to me, and I think the extra building effort is worth putting in to obtain the elegant final result. The only modifications I made to the plan were to make the elevators and fin separate items, hinged with soft wire (to help with the trimming) and add wheel spats, because I like them. 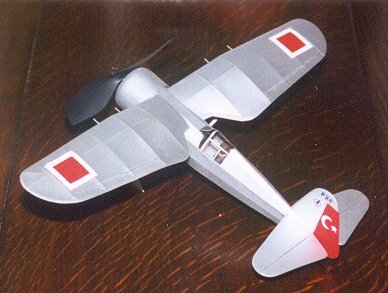 Not all P.24's had them, but the Turkish example I chose did. The finish is Japanese tissue lightly airbrushed with Xtracolor "RLM 01 Silber enamel" thinned with cellulose thinners. All markings , except the small fin lettering, are airbrushed. The prop is a heavily cut down Tern 6" item, and total weight, with noseweight, but no rubber, is 12 grams. Despite a heavy prop, a little noseweight was needed to avoid stalling, and stable left hand circuits in the Alumwell sports hall were soon obtained. The model showed a distinct tendency to drop the left wing while turning, especially at the start of the power run (no doubt due to the torque of the motor) - the angle of bank was very steep, though it kept circulating. The solution was to add a small acetate trim tab on the left wing, and bend it down to keep the wing up. More sidethrust was also added. Eventually nice smooth flights were obtained. My next problem was to choose the correct rubber size - with two loops of .045" the model was landing with plenty of turns left, and not climbing high enough, but with two loops of .050" it was up in the roof structure, bouncing off the ceiling trusses. The solution must be to use use two separate loops - one of .050" and one of .045". I didn't get to try this first time out though, as the model got stuck in the top of the rolled up cricket nets in the sports hall, and when getting it down, it smashed into a table and broke a wing off. All is now repaired and resprayed, but it will never quite look as pristine as it does in these pictures. Since the above was written, the model has been flown with a motor made up of equal lengths of .045" and .050" rubber, folded into two loops, and the power seems just right - the model lands just as the motor stops turning. Best flight to date is 39 seconds from a take-off. This model was started while I was in hospital in December 2001 - I was stuck in there for over two weeks, and for the last four days I got so bored that I asked Ros to bring me a kit, building board, glue and my tools so I could have something constructive to do! In three days I had the framework for this little Avenger, 16.5"span from the Guillows 500 series kit, completed - much to the amusement of the nurses. They were very nice about it, and did not complain about the little bits of balsa all over the floor! I had it finished in a couple of weeks once I got home. I had worked hard to reduce the weight of the model as I went along - Guillows kits tend to be rather over-designed, and have too much wood in them. The wood supplied in the kits also tends to be an the heavy side. 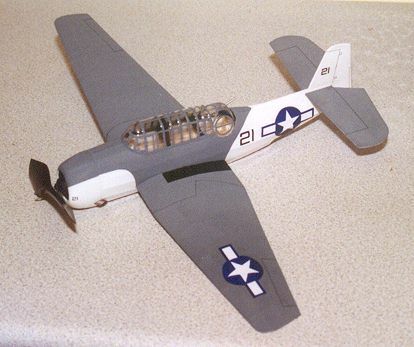 On the Avenger, I reduced the width of all the fuselage keels to about 1/8", reduced the wing leading edge to 1/8", and the trailing edge to 3/16". The fuselage formers and wing ribs were sanded to about half their original thickness, and in addition, lightening holes were cut in the wing ribs. 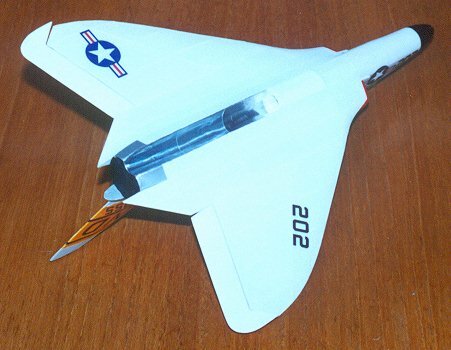 The tailplane and fin were made from medium 1/16" square instead of the chunky parts provided, and the undercarriage was left off. The model was covered with white Japanese tissue, and airbrushed using Humbrol Enamels thinned with cellulose thinners. Markings are home-made decals. 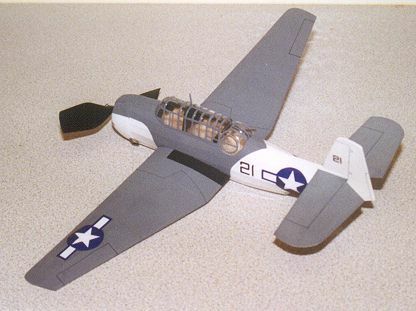 This particular aircraft, in a slightly unusual white/dark gull grey scheme, flew with VC-42 on USS Bogue in 1944, and is unique in that the pilot was awarded the Iron Cross by his fellow pilots after crashing into three other Avengers on the flight deck! 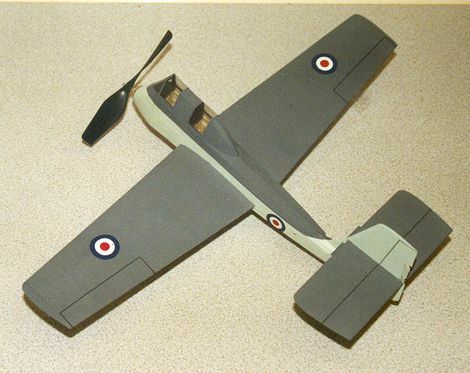 The painted model, complete with slightly cut down Tern plastic prop, weighs 20 grams - I dread to think what it would have been straight out of the box!